Here at Park Place Volvo Cars, we make it our mission to help our customers and other drivers to remain safe in and out of their vehicles. If and when vehicles do break down, one common culprit is a dead battery. 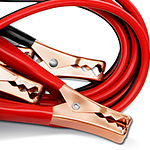 Knowing how to properly jump start such a battery safely is a key consideration. To begin, the rescue vehicle battery should be placed as close to the dead battery as possible. One easy way to accomplish this is to park both vehicles with their front bumpers touching. If this is not possible, drivers should do their best to position the vehicles as closely as possible. At this stage, it is also important for the driver of the rescue vehicle to deactivate their engine before proceeding any further. Next, both vehicles should be immobilized. To this end, both vehicle transmissions should be set to park and emergency brakes should also be engaged if available. Following this, the vehicle operator should locate the positive and negative poles on both vehicle batteries. Positive poles are often red in color and may be slightly larger in size than other ones. Following this, the driver should attach the red clip on the jumper cables to the red and positive battery pole on the dead battery. Then, they should attach the other red clip to the red pole on the rescue battery. Drivers should then attach the black clip to the negative pole on the rescue battery. At this point, the other black clip will be live and drivers should avoid touching it with any part of their body. They should attach this negative clip to an immovable area in the distressed vehicle engine area, being careful to avoid any moving objects. Finally, the driver of the rescue vehicle should activate the engine. After letting it run for long enough to partially recharge the dead battery, the driver of the distressed vehicle should be able to activate its engine.